Wine and beer are the most common beverages that cheese is paired with. But what about cheese and cocktails? Although it's slightly unorthodox, there is no reason why cheese and cocktails can't be paired together. When pairing cheese and cocktails, it's important to consider both the liquor and the flavors added to it. For some cheese and cocktail suggestions, we spoke with Mixologist Jason Ferris and Fromager Dan Utano at Bar Artisanal (now closed) in New York. 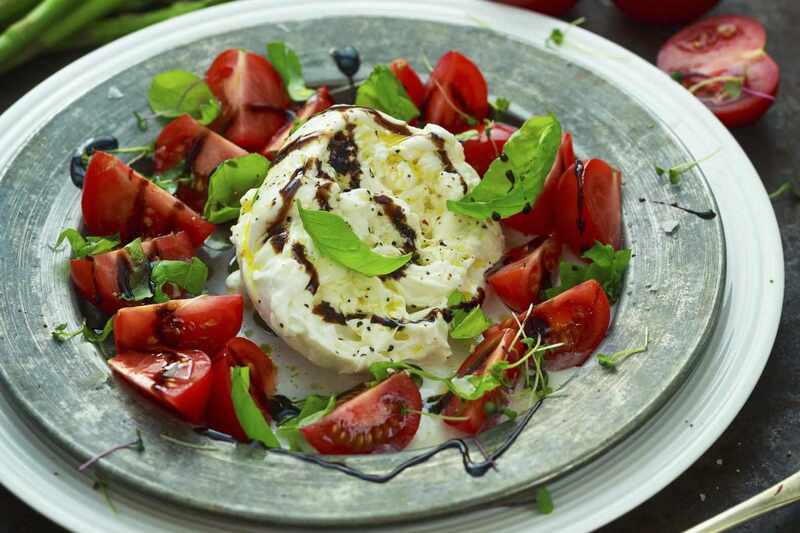 Mozzarella and Burrata are mild, creamy Italian cheeses most often served with tomatoes and basil. So why not transfer these flavors into your cocktail? Mixologist Jason Ferris suggests making a cocktail that mimics a caprese salad. Try pepper infused vodka muddled with basil and topped off with tomato juice. Bloody Mary cocktails also pair nicely with these cheeses. Soft, creamy Valencay goat cheese typically has tangy, lemony flavors as well as some grassy and herbaceous flavors. "The perfumed, herbal quality of gin matches with the herbaceousness of goat cheese," says Mixologist Jason Ferris. Fromager Dan Utano frequently pairs fresh goat cheese with fruit and recommends adding a fruity component to the gin cocktail. During the summer months, Artisanal pairs Valencay and another fresh goat cheese, Coupole (made by Vermont Butter & Cheese), with a gin cocktail mixed with blackberry puree, fresh thyme, and lemon juice and topped with sparkling wine. Other cocktails to try with goat cheese include the Black Martini, American Collins, and Red, White.and ​Sapphire. Brillat-Savarin is a triple creme cheese with flavors of whipped butter and cream. To contrast this richness, Fromager Dan Utano suggests slightly tart fruit, such as cherries. The salty flavor of triple creme cheese also pairs well with a mellow, slightly sweet liquor like rum. At Artisanal, Brillat Savarin is paired with a cocktail of light and dark rums, red cherry puree, vanilla, simple syrup and club soda. Aged cheese like cheddar often takes on earthy and even slightly smokey qualities. The flavors of Scotch are a perfect match. Artisanal serves Montgomery Cheddar with a Scotch cocktail made with sweet vermouth and simple syrup infused with smoky Lapsang Souchong tea. Artisanal also recommends pairing an aged gouda with Scotch. This is because the sweetness of gouda can be a nice contrast to the smokey characteristics of Scotch. The Rob Roy cocktail also pairs well. Azeitao is a Spanish cheese made with sheeps' milk. When Azeitao is made, the curds are thickened using natural rennet from the cardoon thistle. The thistle imparts a nutty & slightly bitter flavor into this earthy, strong-flavored cheese. The strong, funky flavors found in Azeito and in some washed rind cheeses like Langre can be difficult to match with beverages. Artisanal chooses to contrast Azeitao with what Mixologist Jason Ferris calls "a bold and acidic" flavor. The acidity comes from both the alcohol, tequila, and the mixer, rhubarb. Artisanal rims their rhubarb margarita with sugar, which helps smooth out all the strong flavors in this unusual pairing. Azeito also pairs well with the Paloma cocktail. Why Is Your Cheese Crunchy? What's So Amazing About Truffle Cheese? Do You Know Your Cheeses?